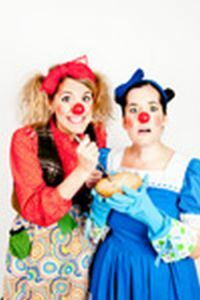 Morro & Jasp: Go Bake Yourself, produced in the Next Stage Theatre Festival, is a clown version of a cooking show. The first course is hors d’oeuvres, which is funny; the second course is comfort food, which is funnier still; the final course is a special homemade recipe which is ludicrously, laugh-a-nanosecond funny. There is physical comedy and prop comedy galore, and audience interaction that is enjoyable, not painful (however, if you are extremely shy never sit in the front row at a clown show.) There is also a lot of mess, though it’s (mostly) on the performers and the set, not the audience members. Hey, what do you expect from a couple of clowns in a kitchen? And there is the moment of darkness: an aspect of this is essential to a clown play. In Morro & Jasp: Go Bake Yourself there is a moment where a loud chipper-sounding hubbub is created from words that, if you listen, tell a story of private despair. This is what gives clown its depth, as it colours everything that comes afterwards so that a simple jape can be profoundly sad underneath, which makes the joke itself more wickedly funny. At the show I attended there was a little girl in the audience, who was involved in one of the audience participation pieces, and when it was over she loudly exclaimed, “That was the funniest show I’ve ever seen!” That’s pretty high praise indeed. Note for parents: If you are considering bringing a child to the show be aware that there is a couple of cannabis related jokes as well as the moment of darker material that I mentioned. I would recommend it for most ages, but I’m pretty liberal like that.